so as i sit in class today..soakin up the intellect of my professor..better yet is TA, a kids phone goes off.. he proceeds to answer it.. i begin to wonder..is this kid reallyy doing this..so i looked over..and he was...so the TA takes his name and the kid freaks out and apologized. the TA proceeds to ask the kid why he felt he could interupt class..so this kid looks up and very sternly said.... "you know what, screw you, shove it" to our TA..im beginning to think...what a douche...so the TA tells the kid to get out of the class as the kid takes his time leavin Brad(the ta) tell hims to hurry and get out and the kid turns around in the auditorium, and about has a heartattack and says "how about i dont give you my phone, and i dont hurry up, and i come down there and give you a whoopin. "..that was my day in a nutshell...it made me wonder if $5000 tuition is reallllly worth that entertainment.. Sounds like kindergarten is about right for that moron's mental capacity and maturity level anyway. wow...that's awesome. are you at Tarleton? Sul Ross? SHSU? I can't imagine someone saying "whoopin" at too many schools. aTm, maybe? Did someone steal your 'return' key? Don't you mean "shift" key??? btw - I don't have a 'return' key. Are you using a typewriter to post here??? TA? Sounds like college. That would never happen where I went to school where 90% of the 'kids' paid their own tuition. The punk would've been yelled out of class by 20 'peers' who needed to get through class and get to work. I BELIEVE THEY DID BECAUSE I CAN'T FIND IT. When I was fresh out of the Army and started attending Northeastern serious-like and paying for it myself there were a few kiddies who tried disrupting classes. They wound up with a long haired freak in their face real quick-like and didn't repeat the behavior. OMG! Were you a "long haired freak"? 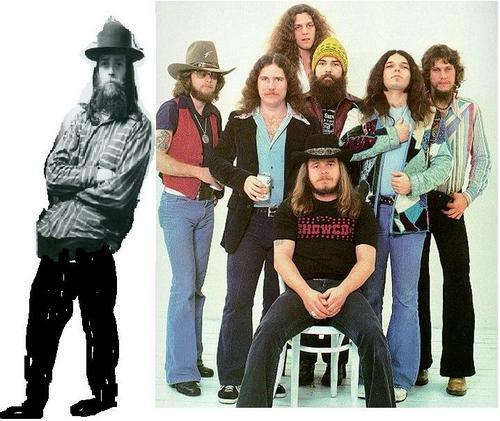 JBP looks like the 8th member of Lynyrd Skynyrd. He must be on a Mac. Same thing like typewriter.